Do you have questions about Spyware IT? No problem, we have answers! Q. What is spyware, adware and malware? Q. How does Spyware IT work? Q. What do I get when I purchase Spyware IT? Q. Are there any update subscription fees? Q. Do you offer a trial version of Spyware IT? Spyware, adware and malware are all types of software that “spy” on your PC and breach your security. Some of these programs are designed to spy on your computer use, and send it to a particular individual (such as a curious family member). Some of the programs are design to flash pop-up ads on your computer screen. Others simply cause damage, acting more like viruses. Spyware, adware and malware can be installed quite accidentally. It may have been bundled with a piece of software you downloaded via the Internet, sent to you in the guise of an e-mail attachment, or installed on your computer without your knowledge. No matter how spyware got onto your computer, if it's there – it's a problem. And you need to sort it out, before it becomes a liability. 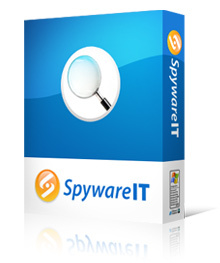 Spyware IT removes all the spyware, adware and malware from your PC for you. It offers total protection, and once installed, works around the clock to ensure constant real-time protection. Spyware IT contains a huge database of almost 100,000 spyware, adware and malware programs. When scanning your computer, Spyware IT identifies the violating spyware and – with your approval – removes it from your system, for GOOD. In addition, Spyware IT quietly runs in the background as you use your PC. This is called “real time protection”. If it discovers that you're about to launch a suspicious file, or that a spyware application is running on your computer, it will immediately alert you – and guide you through what to do next. And it doesn't stop there. To ensure your total protection, the team behind Spyware IT are constantly updating our spyware definition lists – to make sure that you ALWAYS have the very latest spyware, adware and malware protection available. That's our promise! The main part of your purchase is the Spyware IT program. This is the tool that provides around-the-clock protection from spyware, adware and malware. Unlike competitors, we also supply our customers with FREE lifetime spyware definition updates – you'll NEVER pay another cent after buying Spyware IT! In addition, you'll also receive our exclusive Anti Identity Theft software, full versions of RAM Booster and Net Booster, our total 30-page identity theft guide, plus download links for FREE firewall and virus tools. It's just our special way of saying thanks for your custom! You'll receive ALL of this IMMEDIATELY after you purchase. Plus, you gain access to our exclusive 24/7 support team, who will ensure you get up-and-running in the quickest time possible. Now that HAS to be the best $27.95 you've ever spent! Instantly! We'll send you download links as soon as you complete your order. No! Our team constantly update our spyware definitions, to ensure your copy of Spyware IT is always catching the latest spyware, adware and malware. However we DON'T believe in charging extra for this protection. We charge a ONE-TIME protection fee and stick to it. The price you pay is the ONLY amount you'll pay… for LIFE! We do offer a trial version of Spyware IT, limited to five uses of up to 60 minutes each. The setup package also includes a trial of the identity theft software you'll receive FREE with your purchase. To download, please click here. Note that the trial does NOT include any of the free bonuses you receive when purchasing the commercial version. Yes! We offer Spyware IT on CD-ROM, with FREE international shipping, delivered in a hi-tech CD ejector case – for just $42.95. You'll also receive all of the bonuses PLUS instant download links, all for that one low price. Interested? Just click here to purchase using your credit card, or click here to purchase using PayPal. You can view Spyware IT screenshots by clicking here, or read our FAQ by clicking here. Please click here to purchase for just $42.95. Your purchase includes FREE international shipping, a FREE CD ejector case and instant download links - so you can started straight away!